October 1888, it was during the construction of the headquarters of the Metropolitan Police - called to become Scotland Yard -, near Whitehall, that were found the remains of a body. To this day, the identity of this monster, and that of his victim, remain an enigma. 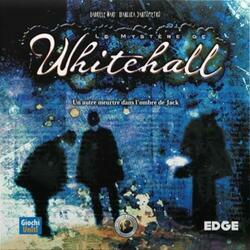 The Mystery of Whitehall is a subtle game of bluffing and deduction taking place in Jack the Ripper London. Three London investigators are on the trail of a dangerous assassin who seems to want to reproduce the horrors of Whitechapel! In the maze of streets, alleys and waterways, the hunt for the mysterious killer has begun.